Honestly, I often get pretty discouraged by climate change and the state of the environment. The problem feels so enormous and insurmountable, and in that state of overwhelm, I feel paralyzed and ponder: could my actions even help a problem this big anyways? Well, I don’t know what snapped into me, but over the last few weeks (and after a lot of research), I decided: yes, they do. Small actions add up, and some positive change is better than zero! Plus, action is always better for me than sitting around letting my anxiety run rampant. So in the last few weeks, I’ve swapped out a few things: beeswax wrap instead of plastic wrap and foil, reusable produce bags, zero straws or coffee lids if I forget my reusable mug, reusable food storage bags instead of Ziploc, all organic and sustainably raised produce and meat…and I’m looking into composting. I can’t quite articulate what got into me, but I’m feeling good about it and can’t wait to see some more little changes in my lifestyle. I spent this past Sunday out and about in North County San Diego. I’ve been trying out a church in Encinitas, and to justify the drive to myself, I’ve been hitting up some of my favorite coffee shops and restaurants in the area (next week: I’ll be making a stop at Moonlight Beach for sure). 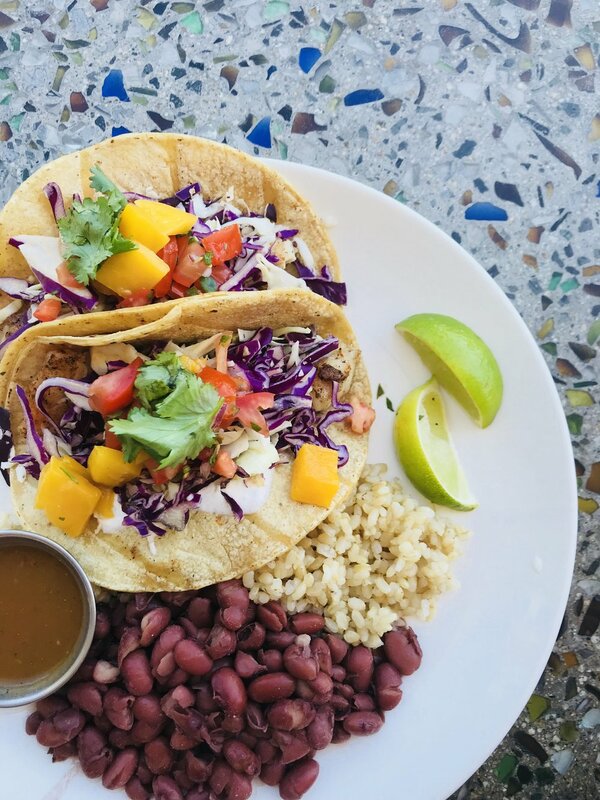 After a stop at Ironsmith this Sunday, I had a hankering for tacos, so I ended up at Haggo’s Organic Tacos, the cutest little taco place right on PCH in Leucadia. The whole space was marine-themed and the menu had some items named after Anchorman. Yes! I opted for the Cousteau tacos (local fish, cabbage slaw, cumin-lime crema, mango salsa cruda). It was all super fresh and 100% organic…and one of the first times I’ve eaten Mexican food without feeling totally gross after. So good. I can’t wait to go back already. Last Friday, I was on “bedrest” for a few low blood pressure and blood volume issues. I don’t fare well with staying cooped up inside at home all day - especially when I feel like I’m wasting San Diego’s current perfect sunny weather. However, my cat Walt snuggled with me all day Friday. He knew I wasn’t feeling too hot, and it was so comforting. Animals’ kind and intuitive spirits are truly wonderful. It made my cabin fever worth it just for the adorable cuddles. A few weeks ago, we celebrated my friend Mike’s birthday in the morning with some post-workout pastries and coffee at Wayfarer Bread, an adorable new artisan bakery in the Bird Rock neighborhood of San Diego. They served Ironsmith Coffee, so I was pretty immediately a fan, and I was completely blown away when I tried the peach blackberry scone. Best. Scone. Ever. The bakery also serves up naturally fermented small-batch breads…and I can’t wait to get some for the perfect slice of morning toast. 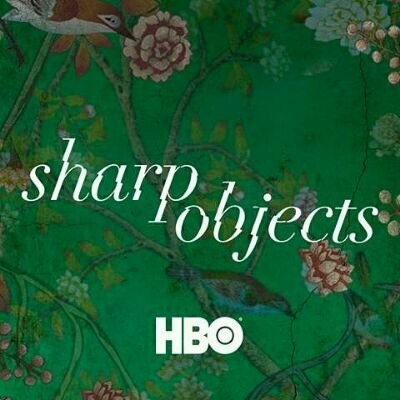 While on aforementioned bed rest, I kept myself entertained by watching HBO’s new series Sharp Objects in its entirety. I read the Gillian Flynn novel years ago and loved it, so I was stoked to see a TV version of it. I had admittedly forgotten some large plot points, which made the series exciting and suspenseful to watch. 10/10 recommend, but if you’re easily freaked out like me, I don’t suggest watching it before bed! As my last blog mentioned, I’ve been struggling hard with stress management and some weird health issues. Needless to say, it’s had some impact on the people closest to me and has brought up some hard conversations that have had me reflecting…in the best way possible. I’m so fortunate to have friends who will bring up the hard stuff instead of skirting around issues, and I truly believe the best growth comes from these hard topics. If you know me at all, you know I’m probably the least crafty person you’ve ever met. So this list item may come as a surprise. However, my friend Leslie has been hosting monthly craft and wine/beer nights that I’ve been loving. I’m not going to say my projects are the best things ever, but I’ve loved every single piece I’ve created. Moreover, the process of crafting has been helping me learn to let go of my idea of perfection and just enjoy the process. Mother Miguel is colloquially known as the Cowles Mountain of southern San Diego County…and after hiking it two weeks ago, I’d have to say I agree. While the distance to the peak was pretty short, the steep and rocky incline totally killed my legs! My friend Gretchen and I opted for a sunrise hike to beat the heat and saw the sunrise over a pretty thick fog bank. It was absolutely gorgeous…and honestly the first time I had been in the Chula Vista area in the last three years here. Did I mention the perfect photo opp at the top?! A few weeks ago, I did a fair share of research on sunscreen for a freelance client…and I was blown away by everything I was so unaware of in regards to sun protection. Did you know there were two kinds of sunscreen? Well, if you didn’t - me neither. Ultimately, the research led me to buying quite a few bottles of sunscreen for daily use. My favorite? Drunk Elephant Umbra Sheer Physical Daily Defense SPF 30. Unlike traditional physical sunscreens, it’s not super thick and doesn’t leave a white glow. But, it does the job, works immediately and doesn’t clog my pores. I’ve been applying under my makeup daily and then on my body when I’m out in the sun. After jumping into the ocean a few weeks ago and realizing that I forgot how much the ocean feeds my soul, I’ve made it a weekly pact to go to the beach at least once a week. I live in paradise - so why waste that? If I don’t have time for a few hours at the beach, I reserve my Friday mornings for walks on the beach with Justin before work. Before hitting the sand to see the sunrise, we’ve been stopping at Clayton’s Coffee Shop, a cute walk-up window spot (next to a bigger diner) in Coronado. They serve up Cafe Moto (yum! )…and have the friendliest baristas I’ve ever met.